After Adelaide, it was time to start making our way over to Melbourne. 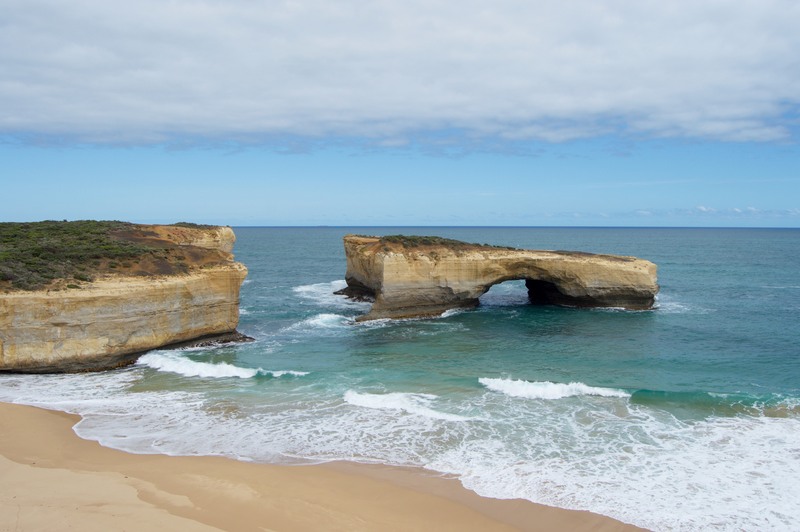 This stretch of Australia is known for its impressive coastline and scenic coastal highway called the Great Ocean Road. 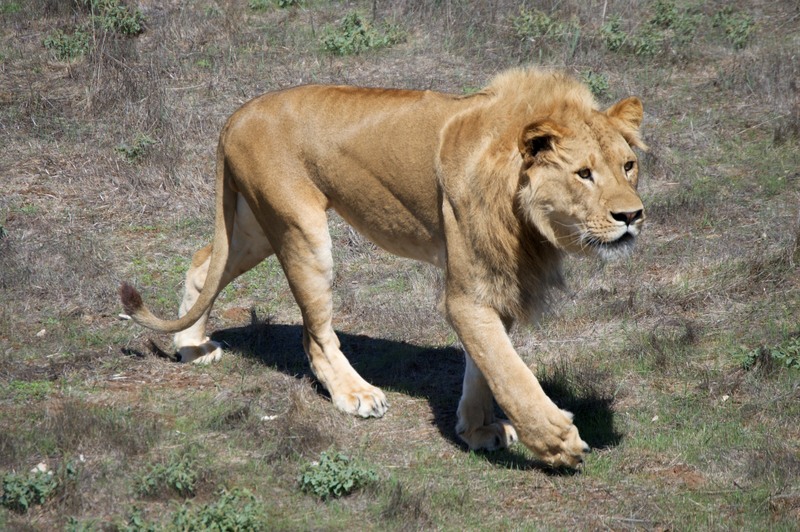 First however, we decided to spend a day at Monarto Zoo, which is an open range zoo not far outside Adelaide. The “open range” concept basically means that the animals are in enormous enclosures (the lion enclosure is bigger than the entire Adelaide Zoo), so there is a shuttle bus that takes you into the enclosures safari-style. It’s quite nice because you get to ride in air-conditioned comfort right up to the animals, with bonus commentary from the guide on the bus. In addition, the zoo’s main focus is actually research and conservation (not, you know, making a lot of money), so the majority of the park and a lot of the animals are set aside for breeding purposes and are not on display to the public. Shorter than a baby giraffe. They also do feeding time presentations once a day for most of the animals, which is really the best way to see them in actual action. The first one we went to was the Tasmanian devil. 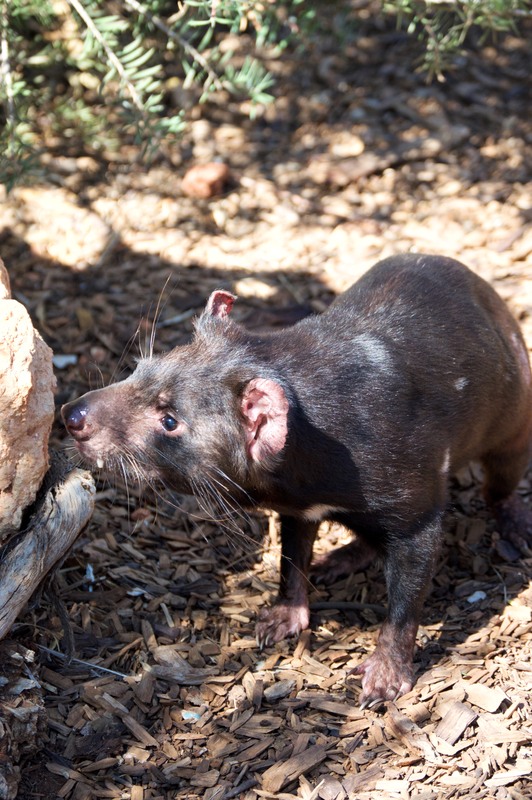 It was my first time seeing a Tasmanian devil in real life, and he was surprisingly big! The devil on display is actually one of like 18 or so that are part of their breeding program, since Tasmanian devils are an endangered species. In the wild, they are being decimated by a facial cancer which is contagious between devils. This is causing havoc and so the zoos and sanctuaries are doing a lot of breeding so they can to keep the population going. Next up was the white rhino, which much to Chris’s delight we got to pet. Not sure you still call it “petting” when it’s a rhino, but whatever. It was pretty exciting. 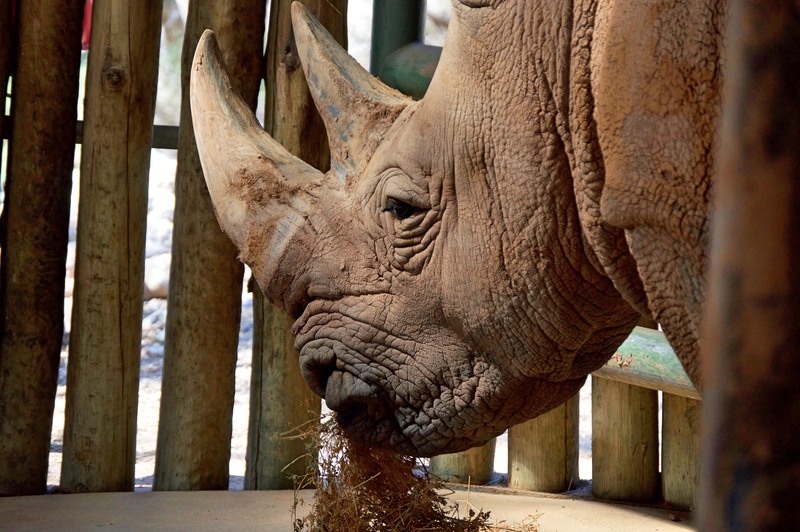 He was very tough and dusty – pretty much how you expect a rhino to feel. Interestingly if you felt his armpit it was actually very soft. Not sure if rhinos have armpits but there you go. 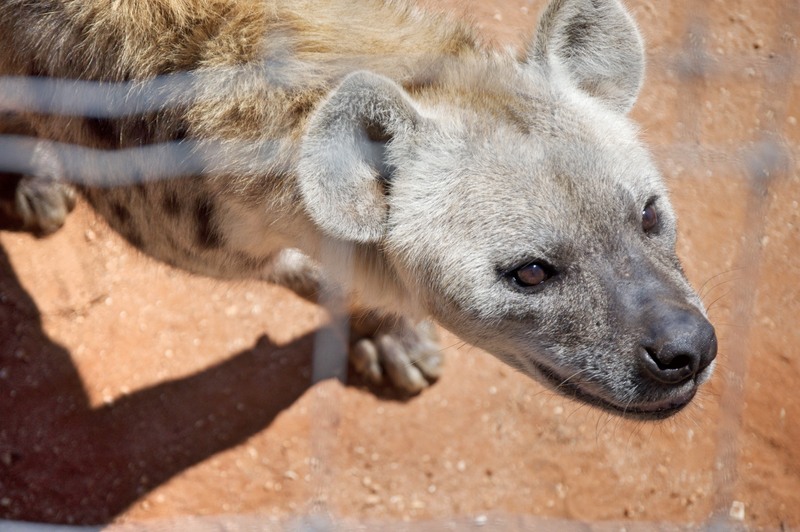 After that we went to see the hyenas and lions. They were motivated enough by the kind-of-gross looking raw meat snacks to come right up to the viewing platform, which was pretty sweet. The lion pride is currently split in two because after the old leader died the female lions didn’t take too kindly to any of the young juvenile males trying to assert their dominance, so instead the two males just hang out by themselves now. Then it was on to Chris’s favourite, the giraffes. 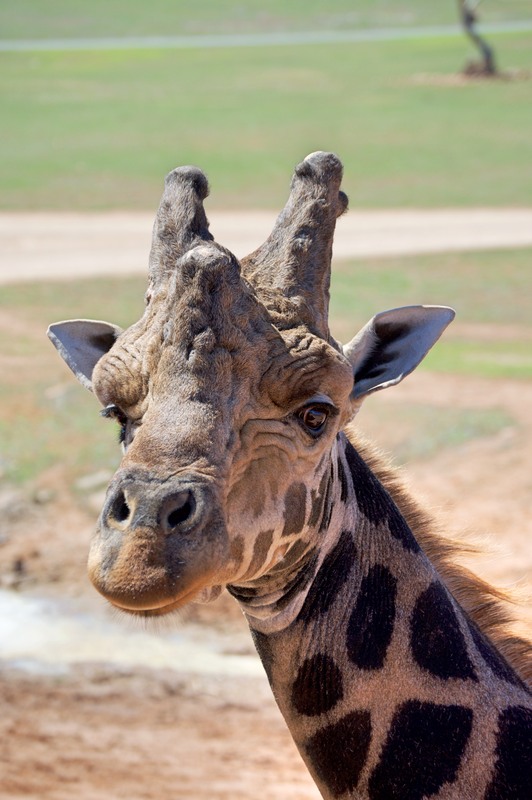 There was one super old man giraffe who seemed to be the leader, and according to the keeper, could basically impregnate any of the females by looking at them. So he looked like he was having a pretty nice life. 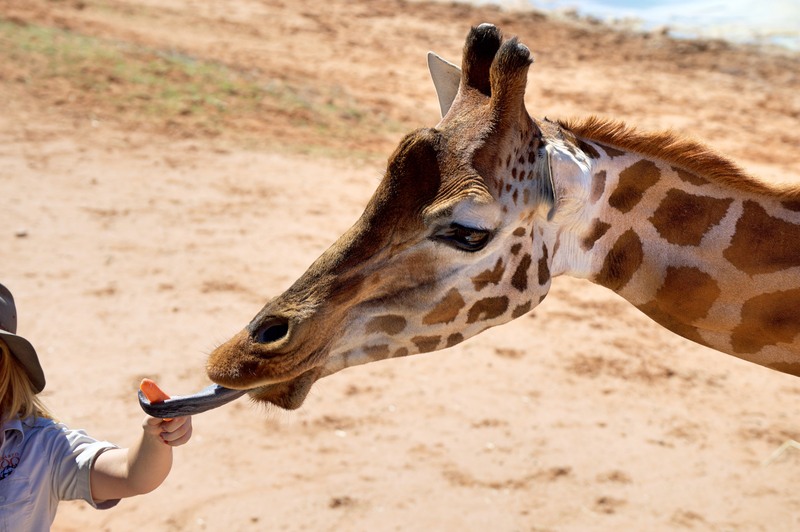 The keeper also fed some of them carrots, which is funny to watch because giraffes have hilariously long black tongues and so they could basically pick up the carrots out of her hand with their tongue. They also ate from some branches that were hoisted onto a pole. 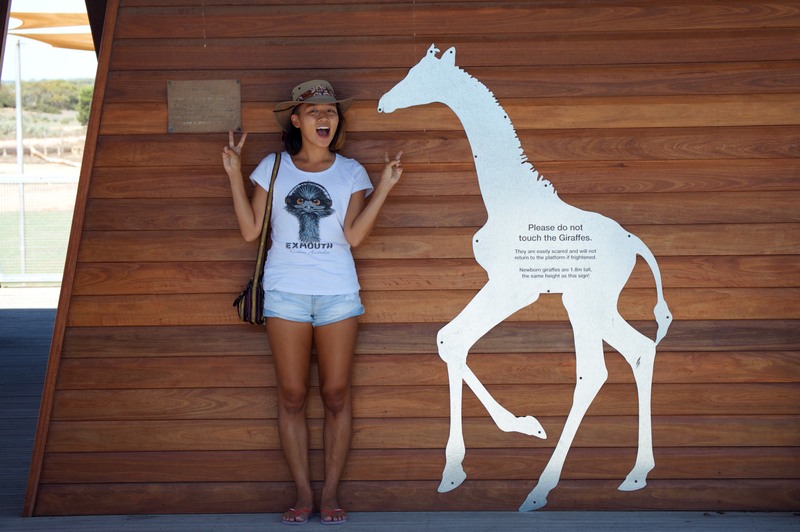 There are no trees in the giraffe enclosure because they would just be eaten, bark and all. On our the way back out of the park we stopped to see the surprisingly well-trained cheetah. Or, sort of well-trained anyway, as it took a lot of coaxing for her to come over. She eventually did, but the trainer said she couldn’t get her lunch now because that would reward her bad ignoring behaviour. Pretty cool to see a cheetah up close though! We spent the night in the nearby Murray River, then headed to the coast! 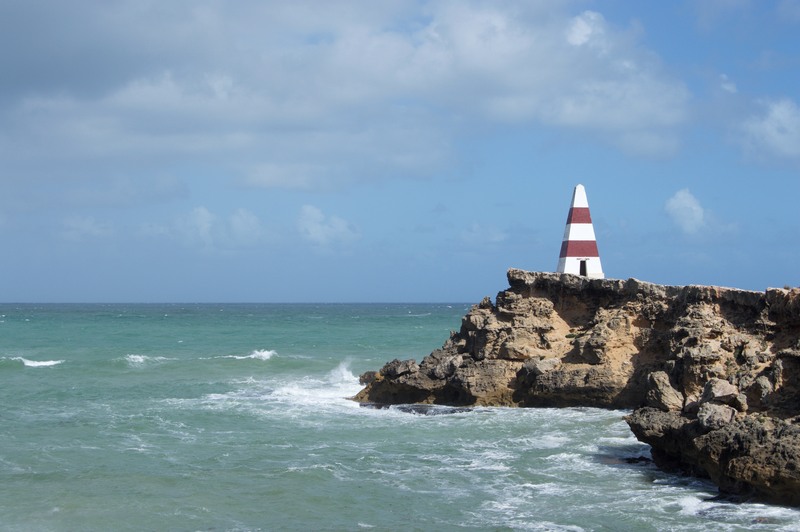 Robe is a cute seaside town that’s popular for vacation-goers and has a big obelisk. I think it was originally a coast marker, but according to the sign by it, it also stored rockets. Why, you ask? Well to shoot ropes and baskets to shipwrecked ships to save people, of course! Don’t know if that ever happened but that is what the sign said at least. 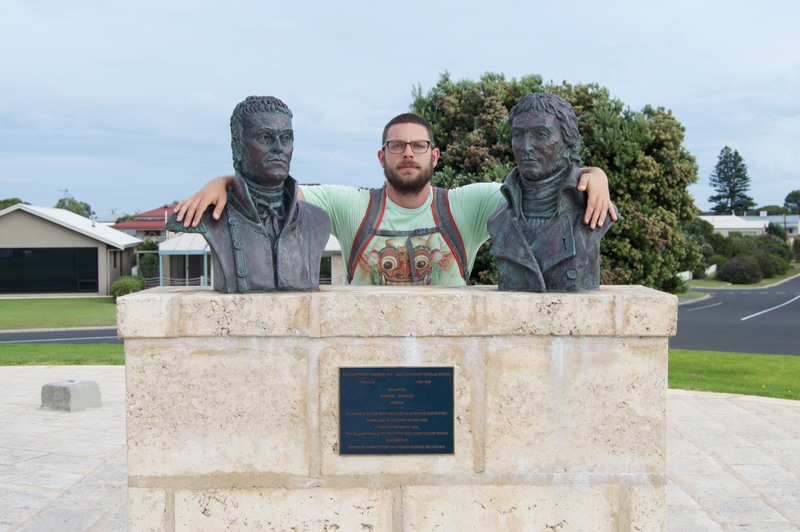 We took a bit of a meander up the coast and into town, where we discovered that Australia’s heroes, James Cook and Matthew Flinders, were good pals. Which is cute. Christopher hanging with Flinders and Cooke. Next up was Mount Gambier, South Australia’s second largest town. 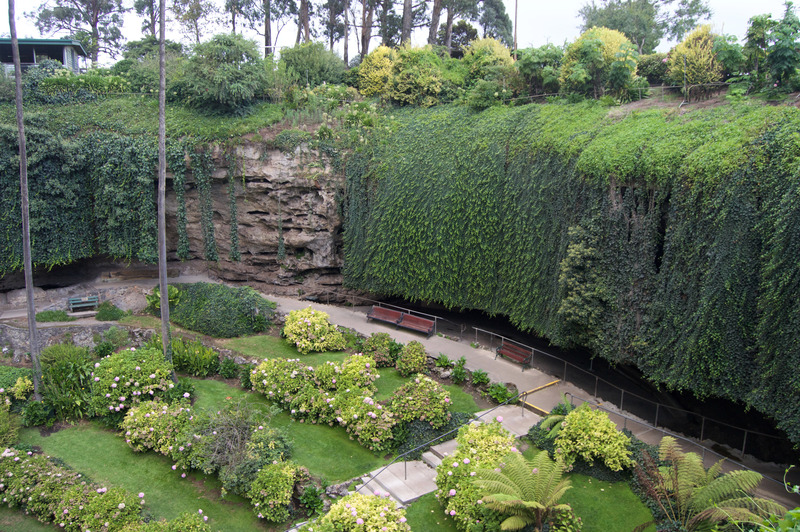 Mount Gambier is kind of a cool place because it’s basically built on a bunch of old volcanos and caves systems. It’s most famous for Blue Lake, a lake in an old volcanic crater that for unknown reasons is grey in the winter and super blue in the summer. Luckily we caught it at the very end of its blue phase. 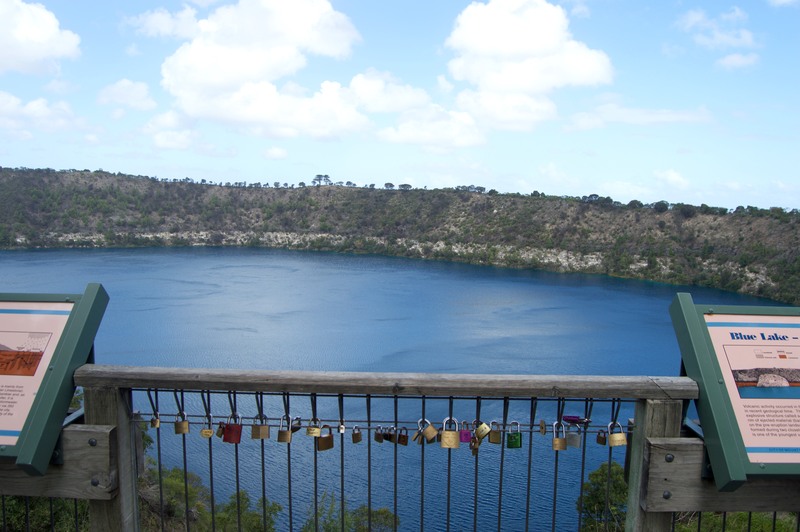 Love locks atop Blue Lake in Mount Gambier. 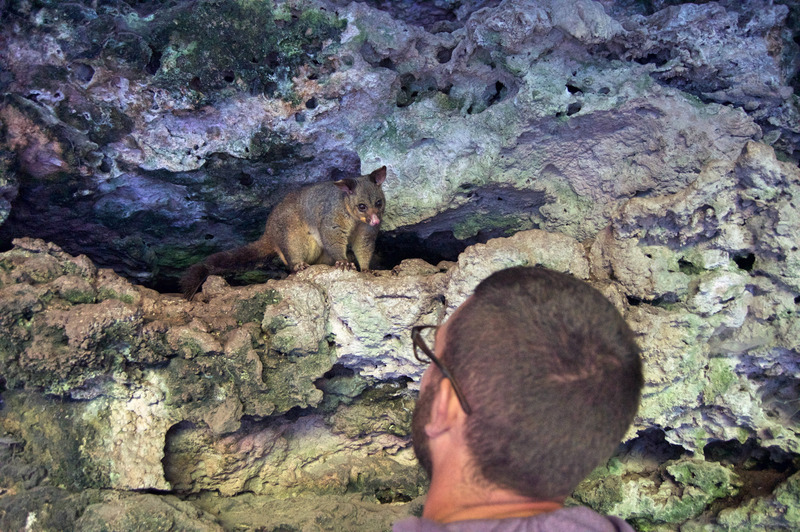 There are two other (less blue) crater lakes in the area, one of which has a nice nature sanctuary where we saw some koalas, kangaroos, and swamp wallabies (the stockiest kind of wallaby). There is also a big sinkhole in town (called Umpherton Sinkhole), which has been converted into a lovely public garden. It’s pretty and lush, but mostly importantly is also home to a bunch of super cute and chubby possums that you can feed. 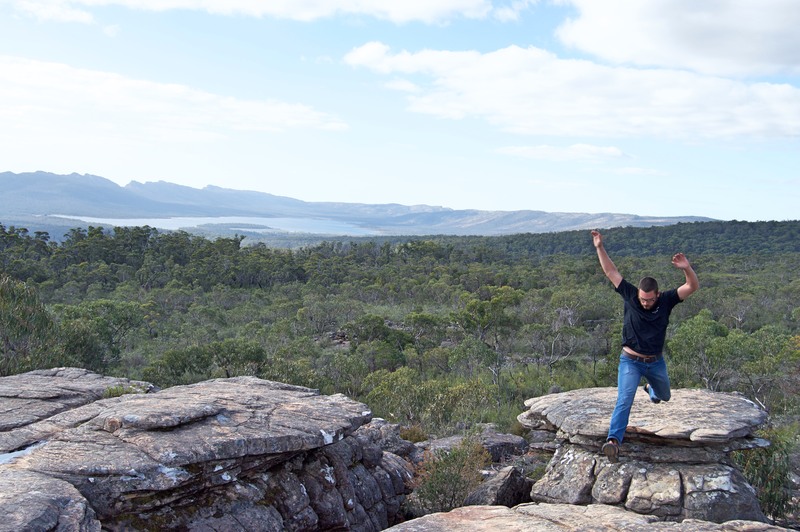 After Mount Gambier, we crossed into Victoria and headed up to Grampians National Park. 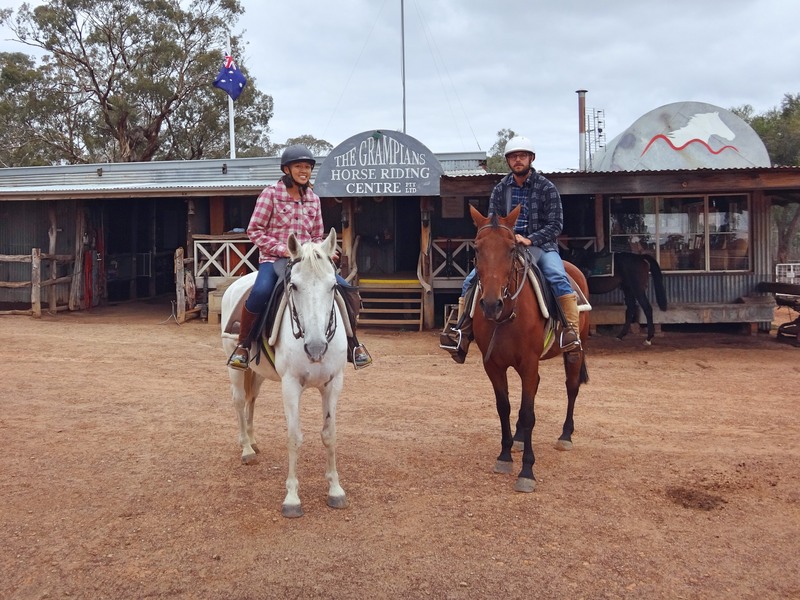 Our first stop was Grampians Horse Riding Adventures, as we had heard particularly good reviews and Chris had been searching for forever for a trail ride that wouldn’t be a “nose to tail” kind of ride. And this place did not disappoint! After receiving some very well groomed horses named Samuel (mine) and Maxi (Chris’s), we headed off. Our guide, Cam, who runs the ranch and is more like an instructor, gave us a bunch of pointers and showed us how to do a rising trot. And then we were off! He said (half-jokingly, I think) he would consider not even taking us if we were from the US (because of how different English and Western style riding is, and in Australia it’s English style) but given how we’ve had very little actual instruction before, we couldn’t have too many bad habits! Turned out it was super fun; it is a lot different to be able to pick out a path along a trail rather than fight with your horse to keep his nose out of the bum of the horse in front. Once we had mastered the rising trot we got to try taking our horses to a canter, which was pretty exciting and easier than I anticipated. At this point Cam pretty much let us trot and canter our way around the ranch to practice. Cam seemed pretty impressed with our riding abilities; halfway through, he got Chris to switch horses with another rider because the Clydesdale cross Chris had been riding was getting too tuckered out to keep cantering with Chris’s giant man weight. The small girl he switched with was probably better suited at that point. But that meant Chris got a fiery horse that loved to run and be in front (and had energy from only carrying a small girl up until then). They had fun. Except for the very end when the horse got startled by a stump or something and decided to go sideways into the trees before coming to a dead stop and nearly causing Chris to topple over the front. But I didn’t get to see that part. Not that I would have been much help as I’d probably have been laughing too much. 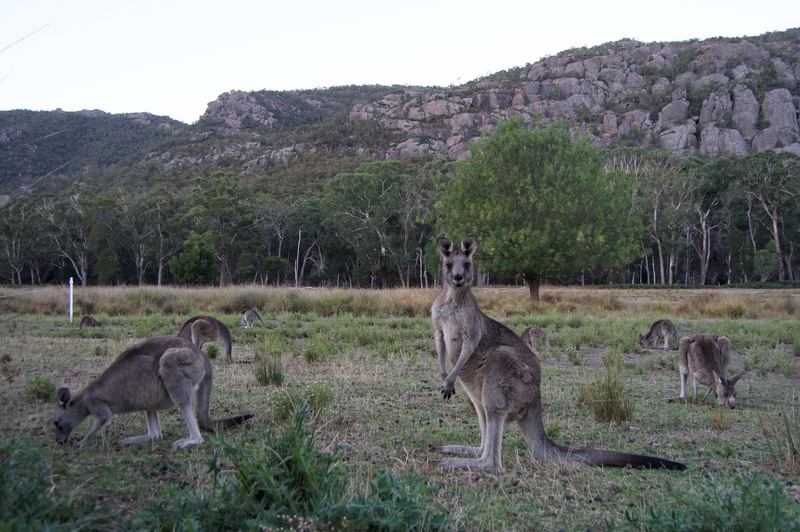 We camped in Halls Gap, at a super cute campground in the Grampians which had like a billion kangaroos. Chris accidentally almost got into a dominance battle with a huge one by our campsite, so that was pretty exciting. It growled and puffed and stood up, locking eyes, and Chris wisely backed down as he still remembered hearing about guys getting their testicles kicked off. The next day we decided to climb up to the Pinnacle. We were feeling ambitious so we decided to hike from town, a slightly longer endeavour than driving up to the car park first. It was a bit of a trek but had lots waterfalls and canyons to pass through on the way to the top. Heading up to The Pinnacle. The Pinnacle was pretty windy but gave some crazy views of the mountains, town, and lake below. Made to the top of The Pinnacle! 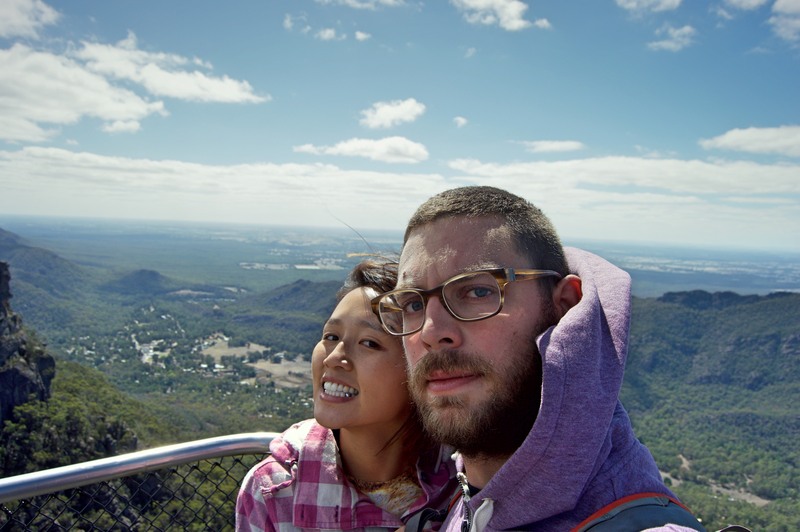 After stopping back in town for burgers and ice cream, we went on a drive to see Mackenzie Falls, as well as visit Boroko Lookout and the Balconies. Christopher not being a very cooperative selfie-taker. After we were done with the Grampians we powered back down to the coast. We took a brief lunch stopover in Port Fairy, then hit the start of the much hyped Great Ocean Road. 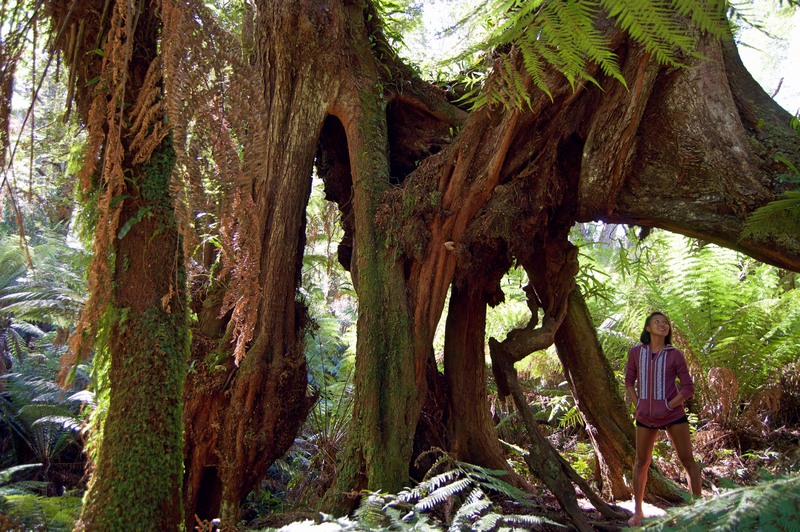 The Great Ocean Road is basically a scenic highway that was constructed mainly by former WWII soldiers. It passes by numerous lookouts that you can stop at to admire the big rock formations. 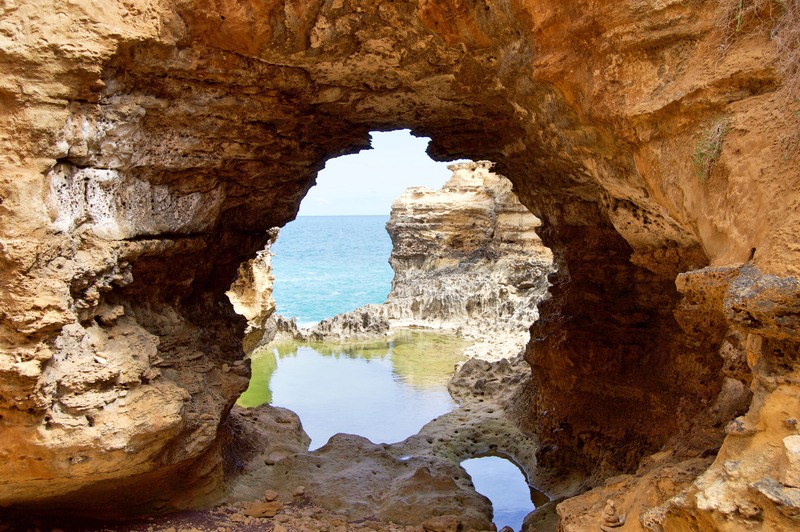 They have fun names and include the Bay of Islands, The Grotto, London Bridge, and Thunder Cave. 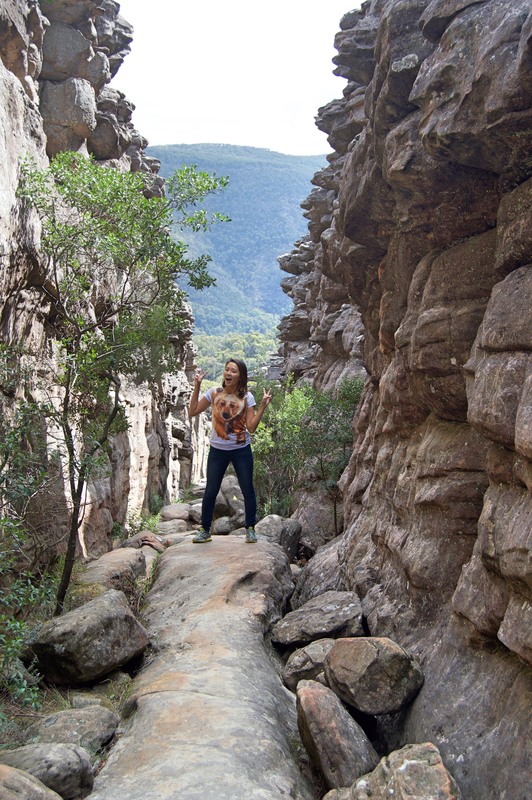 The most famous scenic stops are Lord Ard Gorge and the Twelve Apostles. 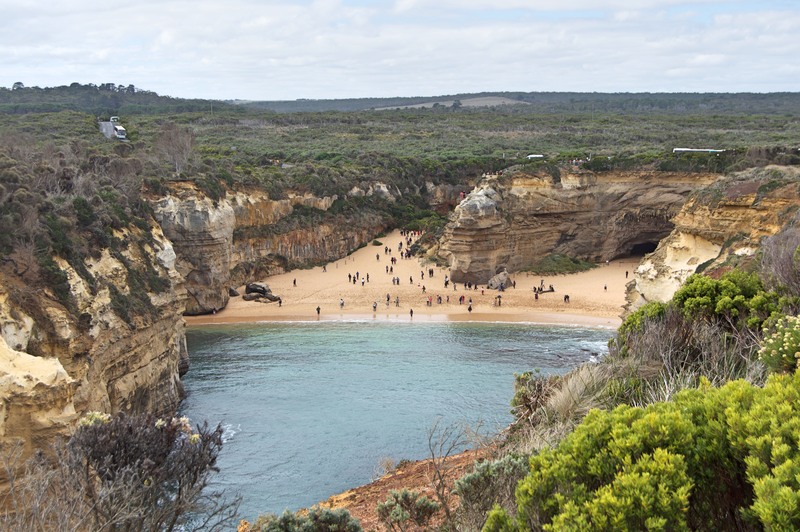 Lord Ard Gorge was the site of a big shipwreck and is now a nice protected beach. 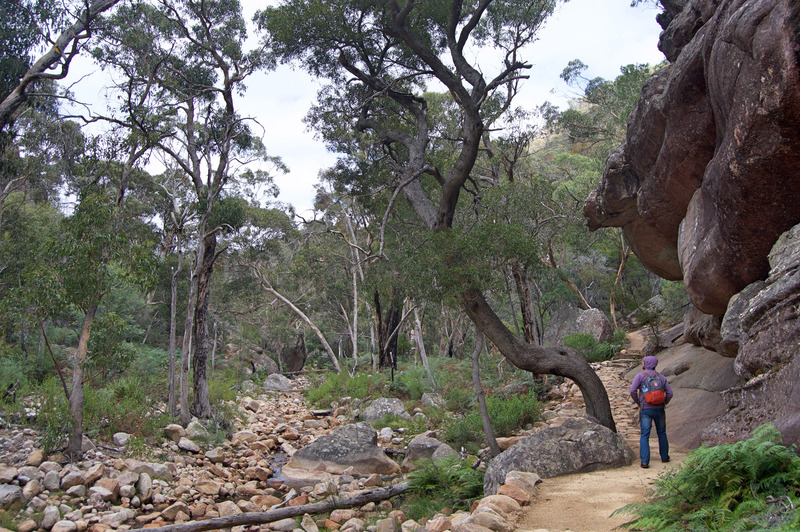 Many tourists in Lord Ard Gorge. The Twelve Apostles (not sure if there are actually twelve of them though) are big eroded rock pillars along the coast. 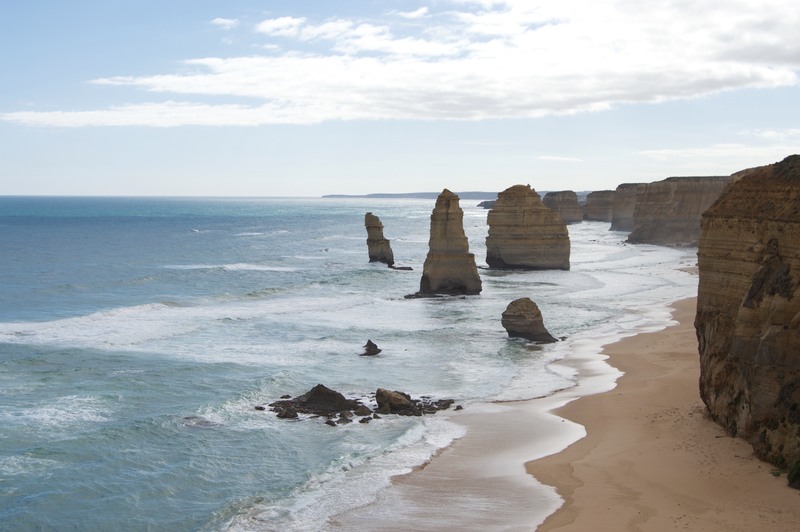 The Twelve Apostles is also apparently a much advertised tourist attraction in Asia, because there were a million Asian tour buses there. So it’s one of those attractions that looks mesmerizing in photos but in reality is a bit of a gong show, basically a sea of selfie sticks and rented vans, with scenic helicopter flights taking off in the background. A lot of Australians seemed annoyed by the Asian tourists, although in my opinion the crowds of over-enthusiastic Asians waving around selfie sticks and making peace signs are less annoying than the gangs of drunk Aussies in Bintang singlets and neon sunglasses that party their way across Southeast Asia. But anyways. Just next to the Twelve Apostles is Gibson Steps, where you can walk down onto the beach and get some nice photos (if you walk far enough that there aren’t any people trying to take jumping photos in the background and whatnot). By the time we had finished at the Twelve Apostles, Chris was getting pretty tired of photo stops and tourists crowds, so we stopped in Princeton for the night. 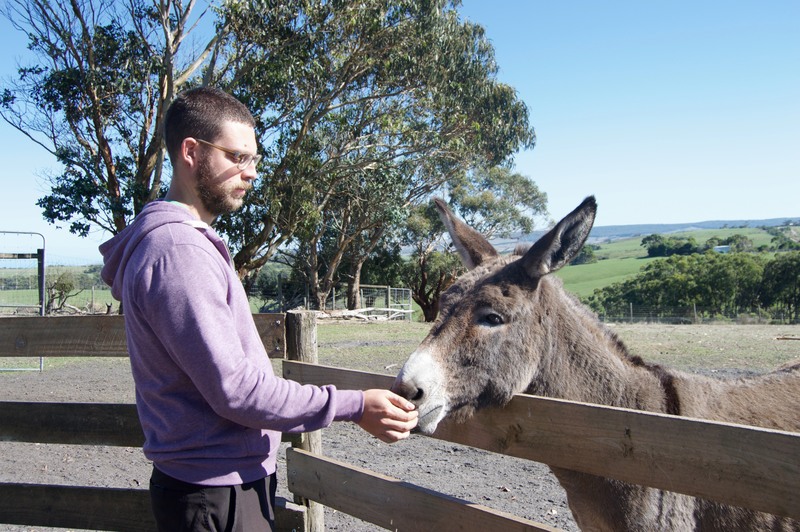 The next day we continued along the coast, stopping at the Great Ocean Road Wildlife Park on our way, where we fed some roos and emus and Chris made friends with a very persistent donkey. 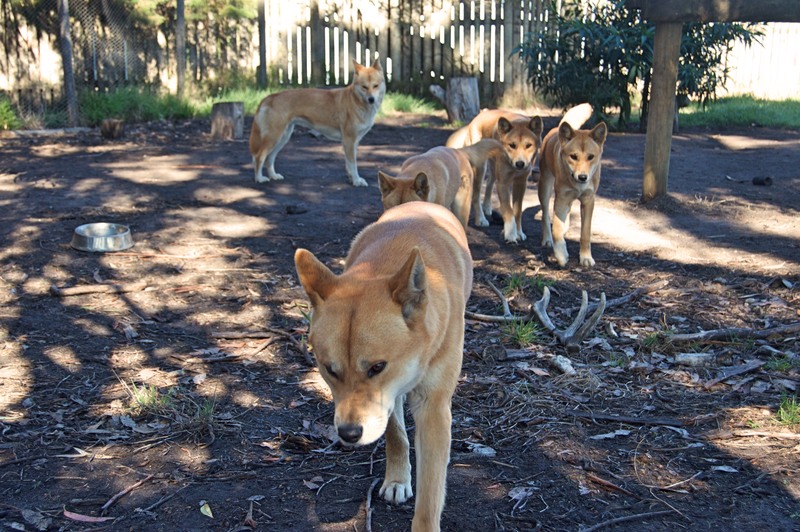 They also has some SUPER SUPER CUTE and very friendly dingoes that you could pet there. THEY ARE LITERALLY JUST LIKE DOGS. As we were dying of starvation at this point, we stopped in Apollo Bay for lunch and ice cream before heading into Great Otway National Park. Excellent ice cream in Apollo Bay. 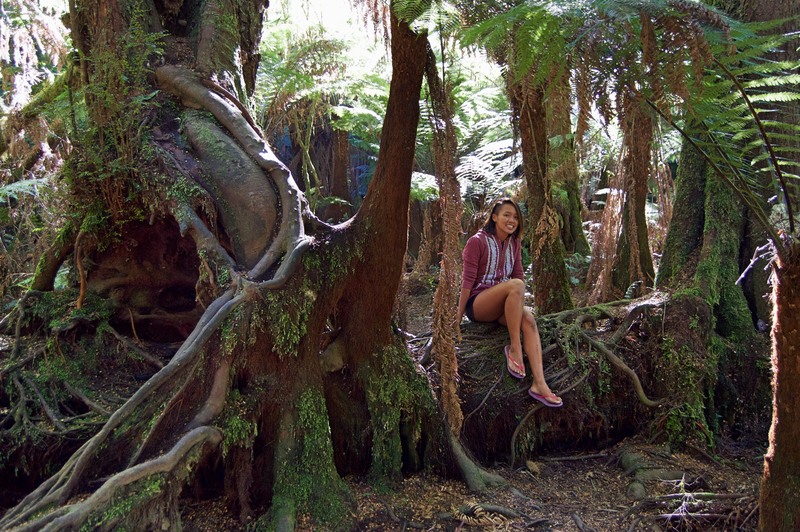 Great Otway National Park, a.k.a. 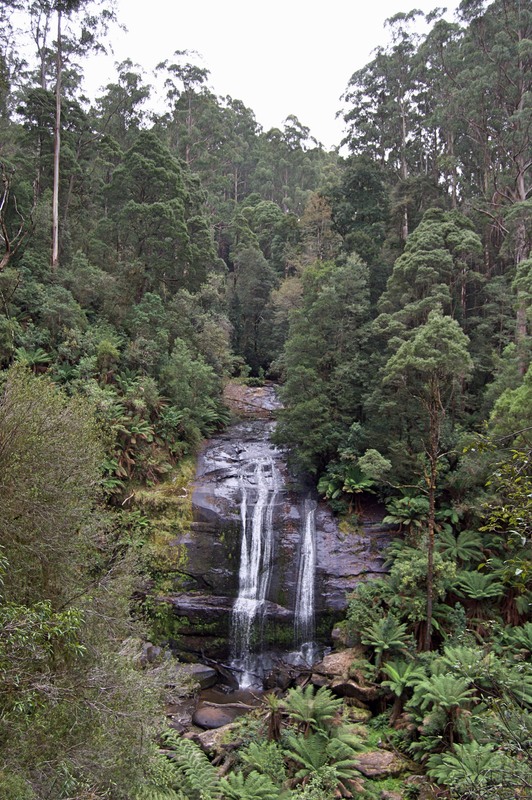 the Otways, is basically a big rainforest full of waterfalls. It’s super green and lush and very “dinosaur times-like” as Chris says, which was a nice change of scenery for us. 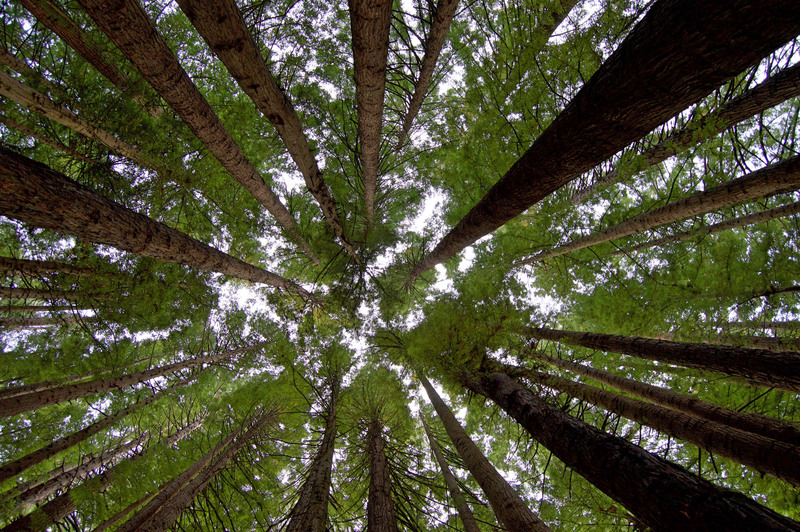 Our first stop was Maits Rest, which is a rainforest walking trail amongst some very impressive trees. Fun trees in Maits Rest. 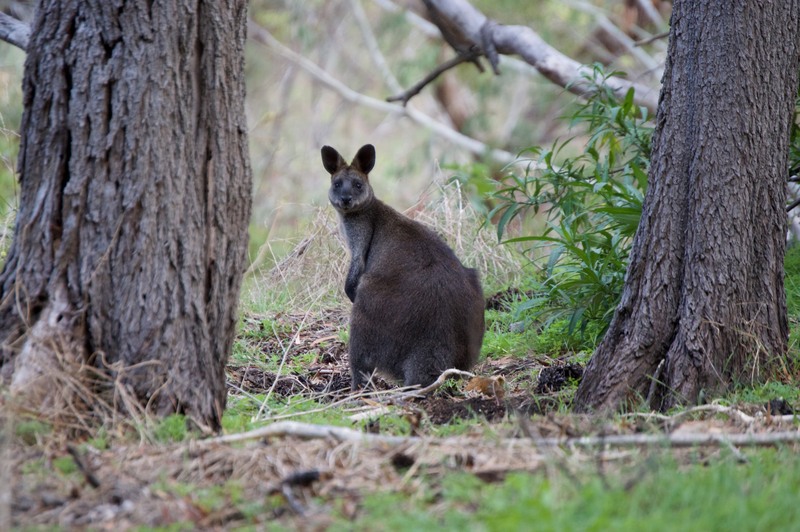 We camped for the night on Cape Otway at Bimbi Park, where there were a lot of koalas in the trees. The next day we decided to hike to as many waterfalls as possible. 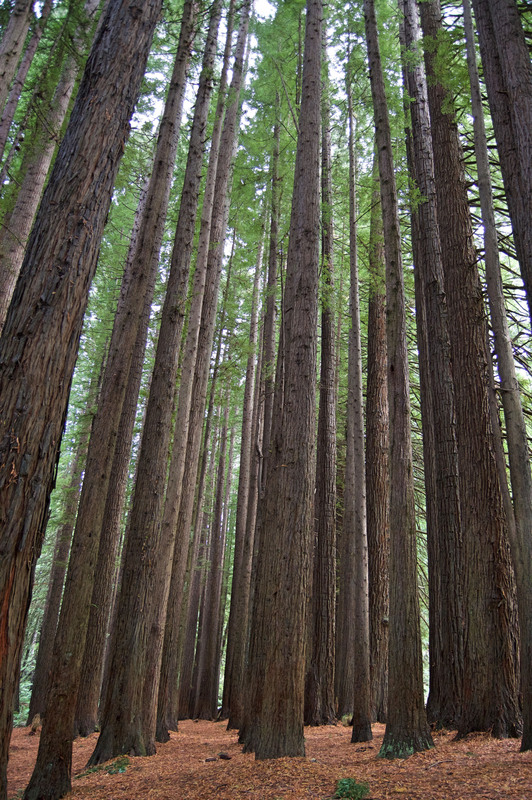 We drove through the park, stopping at the Redwood Forest on the way for some cool photos. 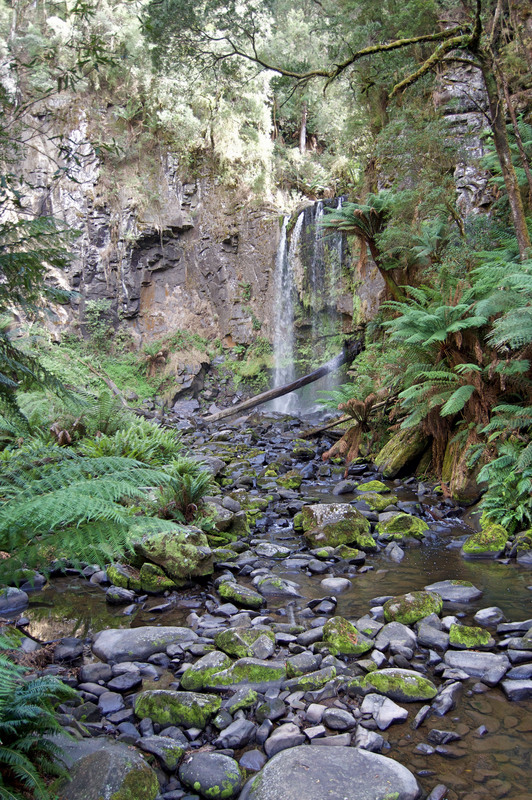 The first falls we hit were Hopetoun Falls. These were our warm up falls because it was only a short jaunt to the bottom and back. We followed them up with Beauchamp Falls. This one was a slightly longer jaunt (we passed a few grey nomads on the way who had given up and turned around). 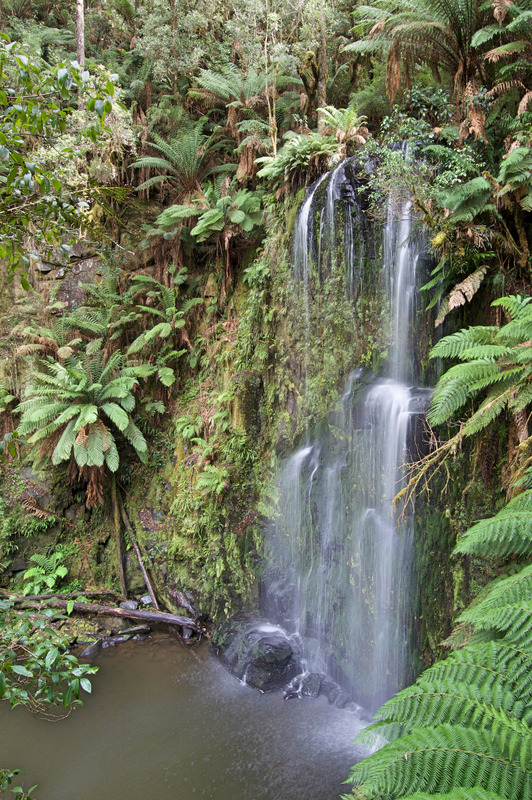 Last was Little Aire Falls and Triplet Falls. This was a longer walk, but quite nice because everything was so lush and green. To celebrate our multiple waterfall success we went back to Apollo Bay for more ice cream. The ice cream shop there is really good! We also stopped to get Chris a pie and learned a fun trick: If you buy a pie a 4:55pm, sometimes you will get a second one for free since they’re about to close. We continued on to spend the night in Kennet River, our last stop before Melbourne. 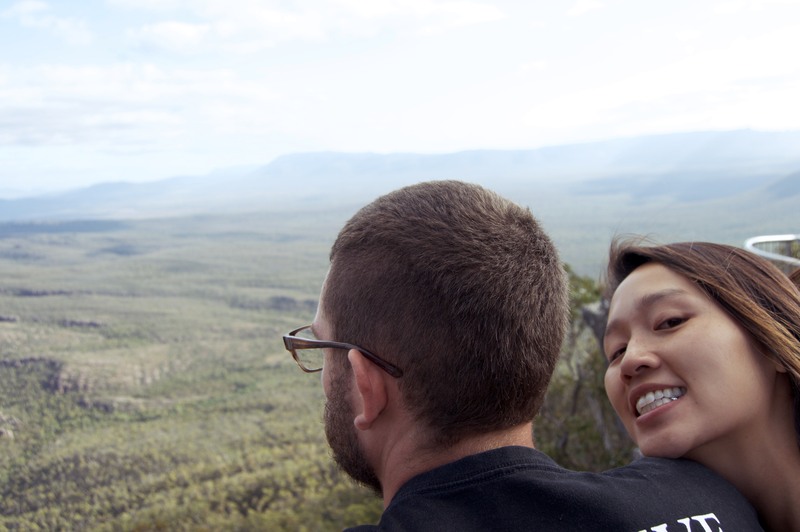 We chose Kennet River because it’s supposed to have a lot of koalas. And we were not disappointed! While setting up camp we noticed one right above our site. 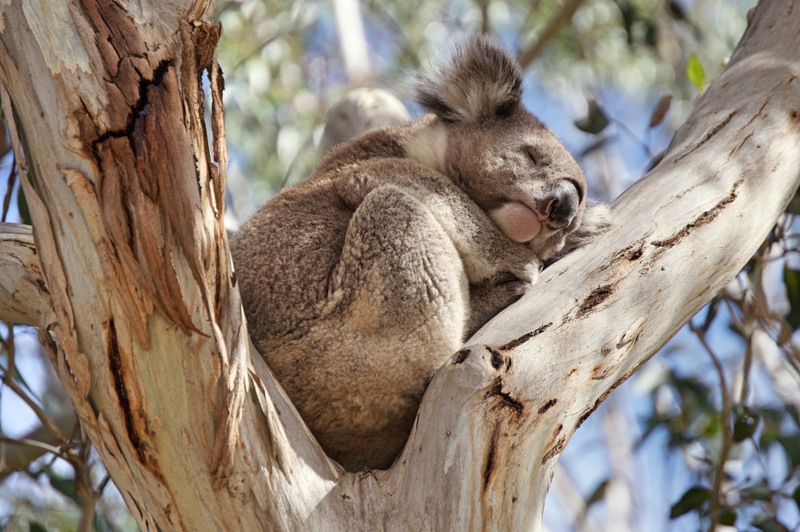 He was pretty active and quite the spectacle as he was clambering around on some pretty skinny branches to reach the eucalyptus leaves. We had quite the crowd of tourists around our site at one point. 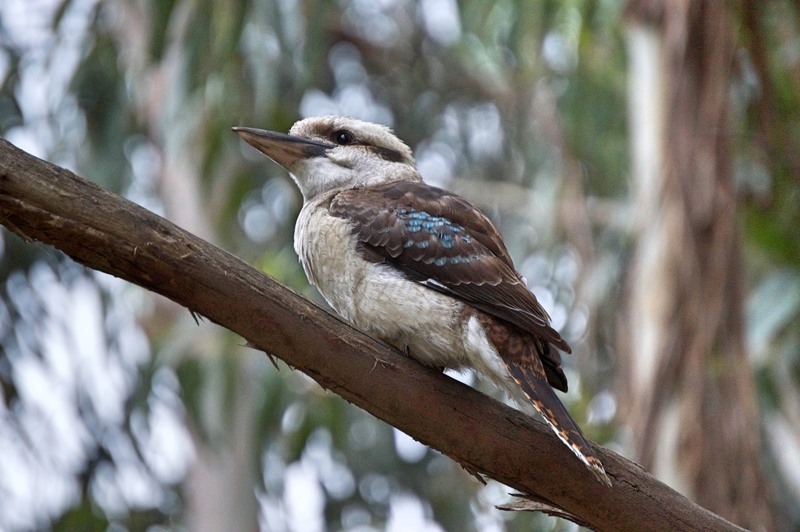 We found five other koalas, lots of parrots and also a kookaburra while wandering around the campground. The next morning, it was time to power on to Melbourne!